Early this year I posted about an ad that the American Beverage Institute ran that compared Utah’s new 0.05% DUI Law to driving while elderly. 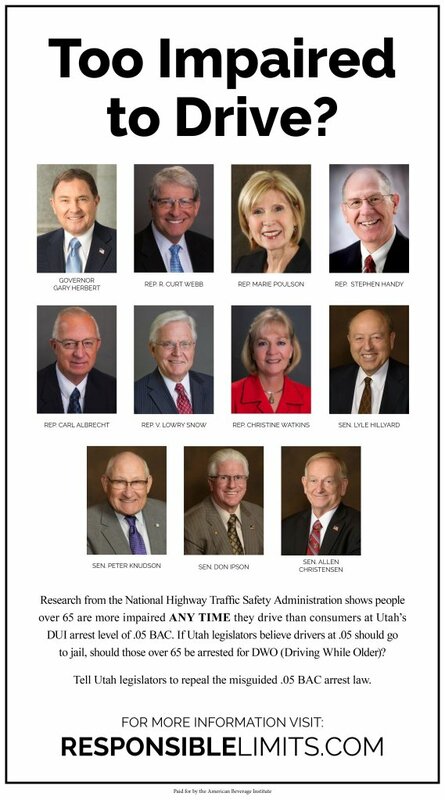 The ad featured many of the Utah government officials who voted to pass Utah’s new 0.05% BAC limit. The American Beverage Institute isn’t stopping there and has once again returned to Utah’s Capitol Hill to make a case for the new law’s repeal. However, Utah law makers weren’t very receptive to ABI’s message, and are still offended by the ad that they were featured in. “I’m still getting ‘old’ jokes,” Rep. Marie Poulson, D-Cottonwood Heights, told ABI’s Sarah Longwell to nervous laughter from other House Democrats. “Yeah, well, I would be shocked if people would allow a bad bill to go forward, something that puts people in jail for one drink and ruins their lives because somebody ran an ad they didn’t like,” Longwell replied. “We will continue to educate people in Utah. We will continue to try to educate lawmakers about why this bill is bad,” she said. Other organizations, such as the Utah Hospitality Association, MADD (Mother’s Against Drunk Driving), and now Skit Utah (the company that market’s Utah’s billion dollar ski industry) have spoken out against the harsh new Utah DUI Law. Rep. Karen Kwan, D-Taylorsville, who I also wrote about earlier is still fighting to get the new Utah DUI repealed as well.